Espalier is the art of training shrubs and trees, usually fruit trees, to grow flat against a wall, on a trellis, or between support wires. Espaliered fruit trees in your garden are whimsical and fun! King Garden Designs' ISA Certified Arborists know when and how to train and prune your fruiting and ornamental Espalier trees for optimal fruit, berry and flower production (Apple, Pear and others), beauty and plant health. We utilize our hand-picked suppliers sourcing specialty fruit tree/espalier, heirloom and many rare varieties for your garden. There are many ways to train the branches, including fan shapes, but typically three to four horizontal wires are spaced about 1½ - 2 feet apart vertically, and the lateral shoots are tied (trained) along the wire running in either direction. For best results, shoots can be initially trained upward at about a 45° angle on a bamboo stake to keep them growing vigorously. Once they reach the desired length, shoots can be lowered to the wire. Vigorous shoots should be cut back during the growing season to encourage spur growth. Lateral growth from the branches should be kept short to prevent shading of lower branches. 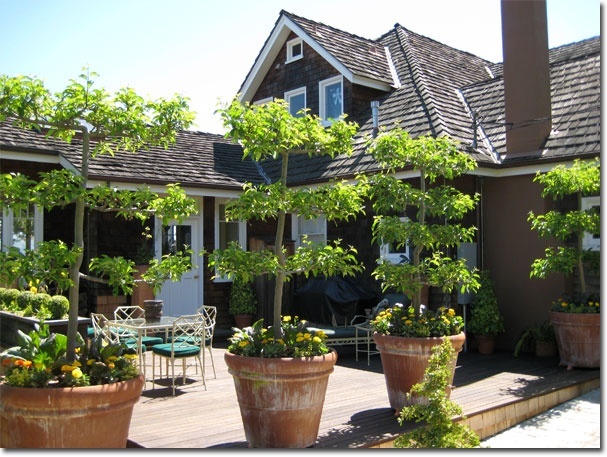 If shoot growth is excessive, provide more space by extending the trellis outward or upward. Always cut back to a bud, a lateral branch, or to the main trunk avoid leaving long stubs when you make your cuts. It will take up to 4 years of training and pruning to have a great looking tree and a bountiful fruit harvest.